Reports on our past lectures in 2018. On the trail of Sir Maxwell Maxwell-Anderson in Malta. Janet recently visited Malta on holiday but whilst there took some time to investigate this man who was the son of the rector of Tooting. Born in 1879, Sir Maxwell was a naval officer rising to the rank of Captain but also a barrister. After leaving the navy he served as attorney general of Gibralter and chief justice of Fiji before retiring to Malta. He died there in 1951. Janet located the grave of his wife who had died in 1945, which had no inscription for him but it was later confirmed that he had been interred in the same plot. She also located the large villa where he had lived and was able to see the grounds of the former naval hospital where he died. The archives in Malta, in particular their National Archived in Rabat were very helpful with her researches. Sir John Thwaites 1815-1870. As chairman of the Metropolitan Board of Works from 1856 to 1870 he was a significant figure in the creation of Londons main drainage system of interceptor sewers designed by the boards much better known Chief Engineer Sir Joseph Bazalgette. Sir John was born in Westmorland and came to London in 1832. He started work in a woollen warehouse and rose to become a partner in the business marrying his bosses daughter. He became involved in the politics in the Liberal interest and this led to his role in the MBW. Before the creation of the Metropolitan Board of Works, control of London sewers had been under numerous local commissions. The Great Stink on 1858 was the pivotal moment which removed political opposition and allowed funding of the great sewerage scheme via a 3d rate for 40 years. Sir John was an advocate of the use of the newly created Embankment as public open space. He died in Putney in 1870 of Dysentry, known at that time as English Cholera. A number of soldiers from Newfoundland who died at the 3rd London General Hospital during the First World War were buried at Magdalen Road cemetery. The graves are marked by a Caribou memorial, note that at the time Newfoundland was not part of Canada. On the 9th November 2018 schoolchildren from Beatrix Potter School organised a 100th Anniversary commemoration which was attended on behalf of the WHS by Jim and Margaret Bell who showed us pictures of the event. As usual to conclude the evening Keith showed us a collection of objects with local connections that he had recently acquired. Wooden boxes from the 1880s commemorating old Putney Bridge. A cycling medal for a volunteer cyclist challenge which belonged to a member of the 26th Middlesex cycling regiment for which Keith has a number of other items in his collection. Related to this is an India General Service Medal awarded to Major Herbert Swinnerton at the end of the First World War. He was a member of the successors to the Middlesex cyclists who as a territorial regiment were sent to India during that war and then to Afghanistan in 1918. Finally he showed an 1842 General Post Office notice listing post offices where money orders could be obtained. Shane Maher of Pre-Construct Archaeology. Shane gave a talk on a recently excavated prehistoric and Roman site in the heart of Walthamstow village near St Mary's church. The site was in the grounds of a school that wished to expand so a dig was undertaken by PCA between February and July 2017 with a watching brief continuing into 2018. Due the area having been heavily bombed in World War 2 it was necessary during machining to have a bomb disposal expert was on site, fortunately nothing of that sort was found. Shane covered the archaeology in 3 phases. He began by describing a number of late bronze age to early iron age features including a 14m diameter ditch, many post holes and remains of quarry pits. Next and the most significant was the Roman period where the evidence for the bases of timber framed buildings, together with significant pottery and building materials came as a complete surprise to the archaeologists. It is thought that the buildings may be part of a wealthy Roman farmstead, but no remains of the 'main' settlement have yet been found. The pottery and coins are of late Roman date, 4th century, but the building materials date from as early as the 1st century. Finally he showed some medieval features dated to the 11th to early 13th century from pottery finds. St Mary's church dates back to the 12th century but it is not known if there was any earlier church on the site. An early 19th century wall base may be able to be linked to properties shown on early maps. 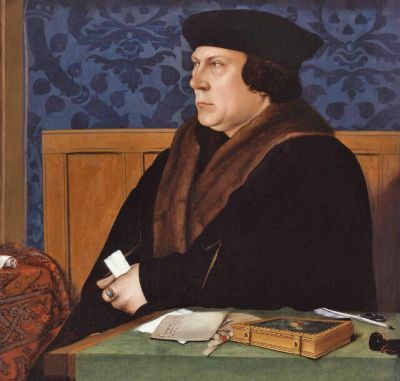 The professor who is well-known from television programmes on Tudor history and the history of Christianity, gave a facinating talk on Thomas Cromwell, Henry VIII's chief minister, to mark the publication of what is likely to become the definitive biography. The talk was given in the place where Cromwell, the architect of the break with the Church of Rome, received his religious education. One of the more intriguing characters in Victorian Britain, at a time when there were many who could be said to fit the bill, was the social observer, Henry Mayhew (1812-87). Notable amongst his several claims to fame was the fact that in 1841 he co-founded the hugely successful comic paper Punch, at a stage in his life when he could count among his friends many personalities who are household names even down to our present time: Dickens, Thackeray and the brilliant conversationalist, Douglas Jerrold, who lived for almost a decade on Putney Common. But beyond doubt Mayhew is today best remembered for his radical social survey London Labour and the London Poor. In this pioneering study dating from the early-1850s he captured the voices of any number of London's street traders - costermongers, bird sellers, flower girls, and the like. Where Mayhew broke new ground was in the blend he created of his own observations alongside verbatim insights into how these working people viewed the lives they lived. His text reads 'like a guided tour of mid-Victorian London', as Anderson put it in his talk, and this hard-hitting yet sympathetic work made an enormous impact at the time. In later life Mayhew followed an erratic pattern of affluence, bankruptcy, mental ill-health, and even a stint as a reporter during the Franco-Prussian War. He died, energetic to the end, aged 74 and was largely forgotten as a writer until after World War Two. Amazingly, no full-length biography of Mayhew existed until earlier this year when Chris Anderson published his London Vagabond: the life of Henry Mayhew, an assessment of the achievements of this fascinating sociologist. For more details go to http://londonlabourlondonpoor.com/london-vagabond/. Fulham Palace is undergoing a major restoration project of which £1.88 Million is Heritage Lottery Funded out of a total of £3.8 Million. Alexis Haslam has been appointed community archaeologist for the project so has responsibility for overseeing any archaeological work as well as recording the existing structures before any work is done. As his title suggests a large part of his role is outreach and community engagement. The talk covered a dig undertaken in 2017 to find any remains of a Dovecote noted in a 17th century survey. This was not found but the dig uncovered a ditch with a fill dated to 1480-1550. There were lots of pottery and animal bone which has revealed the diet from this period. The bone include baby rabbits, doves, suckling pig, fallow deer and most interesting turkey bones. As turkeys first came to England in 1524/26 this is a very early occurrence at the palace. Decorative plaster was also found, removed during rebuilding between 1750 and 1760 this may have been installed during the period of Bishop Juxon in 1636. Alexis then described the use of handmade replacement Tudor bricks to restore the facade and also recording rooms in the roof spaces where the original Tudor timbers are still present. Ted Foster Was a Tooting dustman. He was born in 1886 and joined the Wandsworth Borough Engineer's department on leaving school. He joined the army in June 1915. On 24 April 1917, the 13th (Service) battalion (Wandsworth) attacked Villers Plouich, an enemy-occupied village eight miles south-west of the town of Cambrai. Ted Foster charged a machine-gun nest single handed and wiped out the crew. For this act of conspicuous bravery, Corporal Foster won the VC. Corporal Foster survived the war and returned to his old employer where as a mark of respect he was given the special post of Dusting Inspector. He died suddenly in 1946, aged 59. Interest in his act of bravery has revived more recently with contacts between Wandsworth and the village of Villers Plouich. He began by saying that the first windmill on the common was built in 1613 but not on the current site. The present mill was built by Charles March in 1817 to serve the local community milling flour as the nearest watermills were on the river Wandle some distance away. In design it is a hollow post mill and hence a rather unusual design. The mill only operated until 1864 at which point it became home to 6 families. Despite this conversion it kept its external appearance due to local pressure in the 1890s and it was further restored in the 1970s as dry rot and insects had severely affected the timbers. More recently the sails have had to be replaced after falling off. The museum houses a collection of windmill models which allowed the speaker to illustrate the different types of mill using photos of the models that look deceptively real; until he showed a picture also containing a box of matches! He also brought along a set of minature carpenters tools. In the centenary year of the first women winning the right to vote, Elizabeth Crawford traced the long struggle that led to success. The first petition on the subject was presented to parliament in 1866 by John Stuart Mill, philosopher and political thinker. The campaign was taken up first by the National Union of Women's Suffrage Societies, led by Millicent Fawcett, and later by the Women's Social & Political Union, led by Emmeline and Christabel Pankhurst. Among the local figures who played their part were Charlotte Despard and Leonora Tyson. The WSPU, dubbed the Suffragettes, resorted to acts of vandalism and even terrorism. Although the breakthrough came in 1918, it remains debatable whether the Suffragettes helped or hindered the cause. Dave Saxby talked about the results of foreshore survey work that has been done before construction of the new super sewer under the Thames. This sever will run from Acton to the Northern Outfall at Beckton and will remove the need for raw sewage to enter the Thames at times of high rainfall, as it can do at present from the sewage outfall under the south side of Putney bridge. To build the sewer and allow entrance of effluent large shafts will be excavated along the river so the archaeological impact of these has to be assessed before work starts. Historically there were no bridges between medieval London Bridge and Kingston, built sometime prior to 1219, until the first Putney Bridge then known as Fulham Bridge was opened in 1729. Cross river traffic was served by numerous ferries including one at Putney. In 2014 a site survey was undertaken on the Putney foreshore before works began. Various timbers were noted and chalk deposits. Test borings were made mainly to check for any unexploded bombs. The timbers have been sent for dating but the results are not yet available. The main chalk deposit just upstream of the bridge has been revealed by recent erosion and when fully uncovered measures approximately 9m by 7m. There is another smaller feature further out and a matching one on the Fulham side which is still to be fully investigated. Archival research has revealed a surprising number of paintings and drawings of old Putney Bridge and using these the chalk deposit has been identified as the likely ferry landing, in particular in an 1809 painting an area of this shape can be seen abutting the wall of the church. John Dee (1527-1609) was a celebrated Elizabethan mathematician and astronomer who lived in a grand house on the banks of the River Thames at Mortlake. He also had a fascination for alchemy - as did Elizabeth I - and both were mesmerised by the pursuit of the philosopher's stone, which was believed to turn base metals into gold. But the focus of Professor Parry's talk was a man said to have been Dee's brightest student: Thomas Digges (1546-1595), also a mathematician, astronomer and astrologer. In 1572 he was asked by Lord Burghley, the Queen's adviser, to explain the political meaning of the Supernova (B Cassiopeiae / SN 1572) which had made a dazzling appearance in the skies over London. Digges duly analysed it but, frustratingly, only his covering letter survives. He later produced a handbook on the planets which controversially included the first known depiction of the infinite universe, raising huge questions about the place of God in relation to Man. Despite his many achievements, Digges was, according to Professor Parry, also a conman and forger. Among his powerful enemies was John Whitgift, Archbishop of Canterbury (1530-1604) who was determined to destroy his career, believing him to be dabbling in magic. Digges's time seemed to be up when he was involved in a fatal fight with a man in Kent but he escaped punishment by claiming it was a self-inflicted wound. Other accusations, in particular from his brother-in-law, were mounting against him when Digges died in 1595. For Glyn Parry's book on John Dee, click here. Ireneo Grosso of Pre-Construct Archaeology. Ireno said that this was the first talk that has been given about this site, which in the Roman period would have been to the south of the main settlement of Southwark on 'the mainland', the main urban area being on 2 islands to the north. This site is close to a number of others that have revealed significant Roman remains. The excavation had 4 trenches on a long narrow site which is being redeveloped. Much had been truncated by modern concrete foundations but the excavations revealed the presence of a number of ditches and remains of a Roman road including both the lower gravel layers and the top surface. The site is not on what is currently believed to be the line of Stane Street so is it a 'new' road or will it cause a rethink about the location of Stane Street? The most interesting item found is a Roman sarcophagus. This was on the edge of the road and very close to the outline of a building with deep chalk foundations thought to be a mausoleum. The sarcophagus is very similar to one found in Smithfield and has been removed complete with the contents left in situ for later excavation and analysis. The contents of this will be revealed later in the year. The talk concluded with pictures of some of the small finds from the site, including coins, bone hairpins and a bracelet.